In the 16-17th Centuries Chile was the launch base for Spanish ships interdicting access to the pacific, considered as a Mare Clausum. Shipyards developed in the next 18th and 19th centuries with shipyards such as Valdivia, Concepción and Chiloé Archipelago and later Constitución, chief naval base and shipyard of the Spanish Navy on the pacific. Participating the independance the First Chilean Navy Squadron was established and controlled by Lord Cochrane who introduced British customs. Therefore the Chilean Navy was modelled as close as the Royal Navy the field army was from the Prussians. This navy saw the War of the Confederation (1836–39), Chincha Islands War (1864–66), War of the Pacific (1879–1883) and 1891 Chilean Civil War, retaking the Strait of Magellan in 1843 and Easter Island in 1888 under Chilean control. Chile also led a serie of expeditions in the Patagonian archipelagoes, claiming control to Magellan strait of first strategic importance. 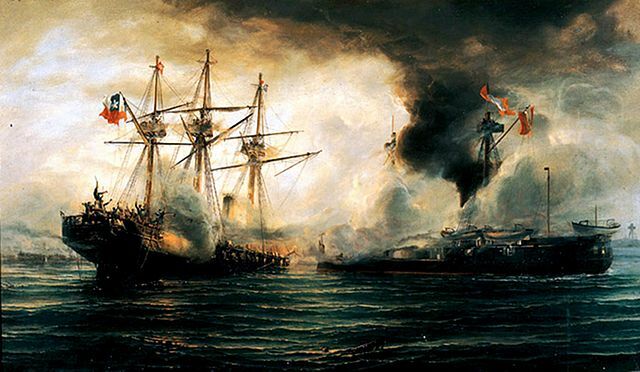 The most famous naval duel of the pacific war era was Huáscar which sank the Esmeralda in an epic way, gaining for Peru a Pyrrhic tactical victory. The return battle of Angamos saw the Chilean capturin the Huáscar and despite two other Peruvian naval victories, the following blocus of Callao followed and the fleet was eventually scuttled to prevent capture. From 1887 to 1902 a naval race was engaged against Argentina, competing to the east for the control of the Magellan strait. In 1887 the Chilean government had already arguably the most powerful fleet in the pacific and planned to purchase one battleship, two protected cruisers, and two torpedo gunboats. The Pacts of May 1902 ended this race (at least between the two countries, as it was revived between Brazil and Argentina for dreadnoughts in 1905). But Chile had a history of problems ordering battleships in UK: In 1901 two battleships ordered as the Constitucion and Libertad were taken over by the Royal Navy, facing the rise of the Hochseeflotte of William II, and were later integrated as the HMS Swiftsure and Triumph. For its first dreadnoughts of the Latorre class, the story repeated this time because of ww1 (see below). Chile would eventually get its first dreadnought in 1920 but the situation was quite different then. 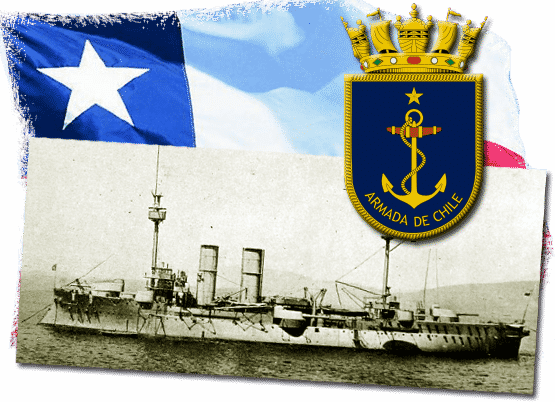 Still modest in 1914, the Armada de Chile was the third in tonnage in South America, behind Argentina and Brazil. These two fleets launched in the construction of Dreadnought very early on, Argentina having the two Rivadvia, and Brazil the two Minas Gerais. Chili did order too two dreadnoughts battleships in 1911, but did not receive these until 1920. In fact both dreadnoughts (really powerful even in British standards) were built at the Armstrong yards under the name of Libertad and Santiago, and then Almirante Latorre and Almirante Cochrane. They were started in 1911 and 1913 with their planned launch in 1913-14, meaning that both units were requisitioned by the Royal Navy in the course of completion. The Almirante Latorre was launched in 1915 under the name of HMS Canada and was sent to the fourth squadron, notably fighting in Jutland. Almirante Cochrane was, however completed as an aircraft carrier in 1920 under the name of HMS Eagle. 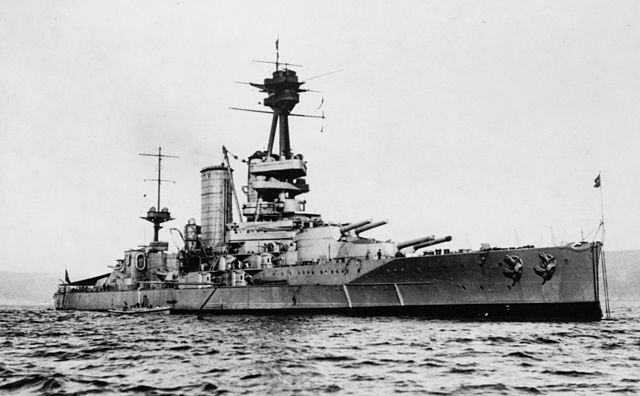 The first was eventually donated to the Chilean Government in 1920, while the second, which Chile wanted to rebuilt as a battleship, was kept in service in the RN and eventually sunk in 1942 by U73 in the Mediterranean. For the rest, Chile had an overwhelming proportion of ships also built in Great Britain, the only exception being the “young school” thought-out Capitan Prat design, built and launched in 1890 at La Seyne, as well as two cruisers, Presidente Errazuriz and Presidente Pinto. Only the first remained in service in 1914. All other later ships were of different designs from Armstrong shipyards, launched between 1893 and 1898. It was therefore a relatively homogeneous but aging navy. Destroyers built at the White shipyards of the Almirante Lynch and Williams classes (1913, 1914) were the only modern units in the fleet. Chile acquired its first submarines in 1917, and six US Class H units were transferred at that date. 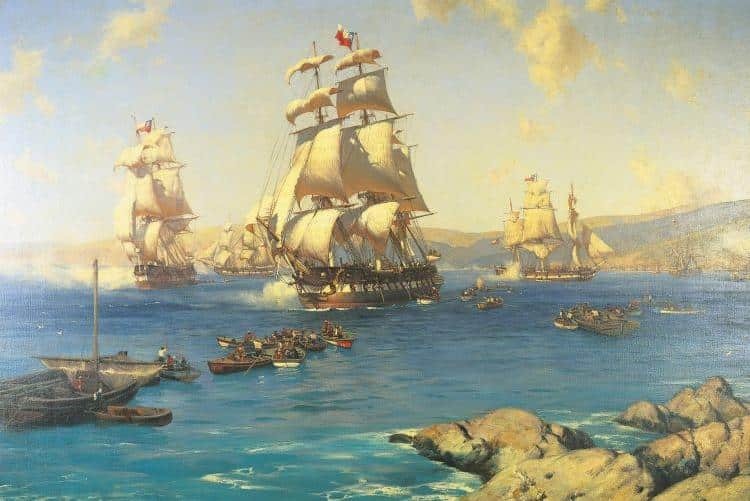 In addition, the formation of the crews and the Chilean naval doctrine was entirely modeled on the tactical principles of the Royal Navy for a long time, notably since the founding of the naval college of Valparaiso, by a consortium of British advisers since 1911. Despite this acquaintance with London, Chile Like the rest of the American continent stayed neutral in August 1914, even so when the Germans and the British clashed in Coronel’s waters. 6 Cruisers: Esmeralda, O’Higgins (Arm.Cruis. ), Ministro Zenteno, Blanco Encalada, Presidente Errazuriz, Chacabuco, Tomé (torpedo cruiser). 9 Destroyers: Captain Orella, Captain Jarpa, Almirante Lynch, Almirante Condell. 18 Miscellaneous: Torpilleur Injeniero Hyatt. Battleship-school Almirante Cochrane. The neutral position of Chile, which was in line with the positions of the other American states under the supervision of the “big brother” of the North, was also due to various factors weighing heavily in the balance: First, the weakness of The Chilean fleet, which had not yet received its first Dreadnoughts (and will not receive them because of the conflict). The rest of the fleet was aging and of little weight. The “benevolence” towards the Germans was explained by their considerable investments there (and history with the Chilean Army) as well as the political weight of German economic immigrants who came to Chile after 1920 and after 1929. Finally, the weak Chilean shipping fleet (87 steamers and 33 sailboats) could easily be hurt by U-Bootes in case of a commitment to the triple cartel. As a result of this neutrality, many German steamers, including supply ships of Von Spee’s squadron, were loading in ports of Chile and took refuge there after the defeat of the German squadron. Many German Merchant ships were later interned but not claimed by Chile since the categorical refusal of the Kaiser. At the armistice of 1918, several of these ships were even scuttled by their crew and lost to Chile. The Interwar passed wtihout much modern acquisitions but the Latorre, Serrano class DDs and O’Brien class submarines. In 1923 a British Naval mission was established and to the old traditions succeeded in the latest tactics and management practices of the RN. The Chilean Navy had the reputation to maintain its ships in first class order. Testifying of this the US Navy briefly tried to purchase the Latorre, destroyers, and the depot ship Araucano shortly after Pearl Harbor. Dreadnought Almirante Latorre doing her sea trials in 1921. Conways all the worlds fighting ships 1865-1906 and 1906-1921. Built at the Seyne, on a typical diamond artillery plan of the young school, the Capitan Prat battleship was the only infidelity to the traditional British orders. 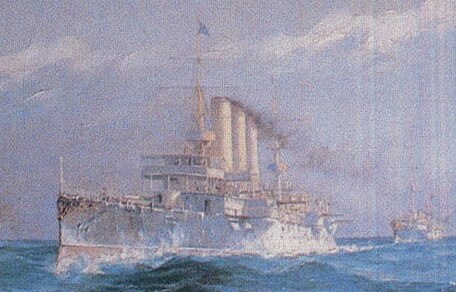 The main heavy unit of the Chilean Navy, it was re-equipped in 1909 with 12 new Babcock boilers, its speed going from 18.7 to 19.5 knots and its chimneys being raised. His career ended with his use in 1931 as a submarine depot. It was demolished five years later. Propulsion: 2 turbines, 5 boilers 12 000 cv. And 18.7 Max. Large British-built Armoured cruiser (Armstrong, by famous naval engineer Philip Watts), she was the most powerful unit of the fleet in 1914 with its 7000 tons. Its steel construction also included wood and copper sheets. In 1910 it undergoes a redesign, losing its 4 pieces of 152 mm in casemates. It will be demolished in 1929. Propulsion: 2 turbines, boilers, 16 000 cv. And 22.25 Max. This Armoured cruiser built at Armstrong was the second most formidable unit of the Chilean navy. Designed by engineer Philip Watts, it was commissioned in 1898. 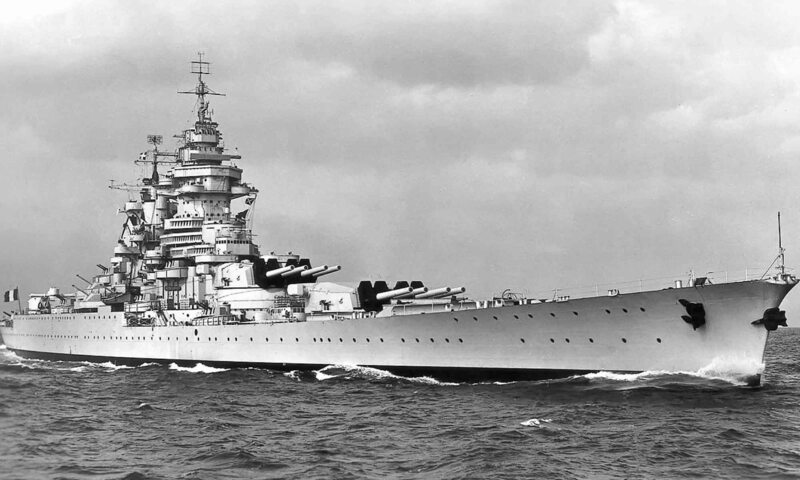 Its 203 mm pieces were diamond-shaped, like the French battleships, with two in the axis in single front and rear turrets and two others also In simple turrets on the flanks between the front chimney and the footbridge. The 152 mm pieces were in single turrets on the flanks towards the rear or in lateral barbettes. Its most important secondary armament was destined to fight against the torpedo boats. The O’Higgins would have been rebuilt in seaplane transport in 1919 and would have remained in service in that role until 1926, shortly before its demolition. Propulsion: 2 turbines, 30 boilers Belleville, 16 250 cv. And 21.6 Max. The cruiser Blanco Encalada was built by the Armstrong yards. Fast, but little protected, this ship was on the other hand very powerfully armed for its modest size. He had a long active career, serving during the two world wars, from 1920 as a training ship, then as a pontoon before being demolished in 1946. Propulsion: 2 turbines, 8 boilers 14 600 cv. And 22.8 Max. Initially Almirante Lynch, torpedo gunner, built in Laird as its twin Almirante Condell. Their boilers were replaced in 1910 by Belleville, and they received a new system of firing and an armament of pieces of 6 pdr. They kept their 5 torpedo tubes, one of prow and 4 of flank and were renamed on that date Tomé and Alcahuano. Propulsion: 2 turbines, 4 locomotive boilers, 4530 cv. And 20.3 Max. Armament: 7 x 50 mm, 5 TT 356 mm. The Overseas Torpedo was part of a class of 4 units (Orella, Gamero, Serrano, Riquelme) built in Great Britain at the Laird shipyards, specialists of this type of ships. They were withdrawn and demolished in 1930. Propulsion: 2 turbines, boilers Normand, 6250 cv. And 30 knots max. It was part of a class of 2 units (Jarpa, O’Brien) built in Great Britain at Laird yards, and very close to the Orella class ships of 1896. This first-class torpedo boat was part of a group of six, built in Great Britain. All but two faced the South Atlantic, the last two being sent in pieces by cargo and finished on the spot. Propulsion: 2 turbines, boilers, 2200 hp. And 27.5 Max. 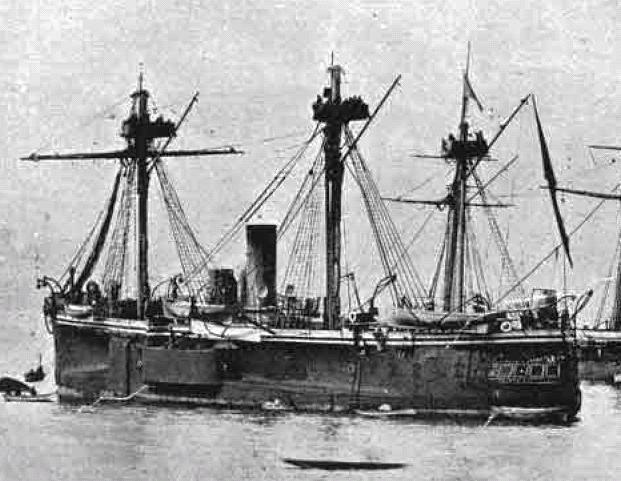 Former Chilean naval ship in 1914. This small battleship built in Great Britain at Earle, in the company of the Valparaiso in 1874, was rearmed and modified, but kept its 152 mm pieces in a central recess, losing its Masts and sail, and equipped with quick-fire cannons against torpedo boats. It served from 1900 as a school ship of gunners and then torpedo boats, before being used as a floating depot in 1908, and being removed from the lists in 1933. Propulsion: 4 compound turbines, 6 Yarrow boilers, 3000 hp. And 13 kn max.